The iPad mini 4 and iPad Air 2 Intensity Scales are a close match to the Standard. 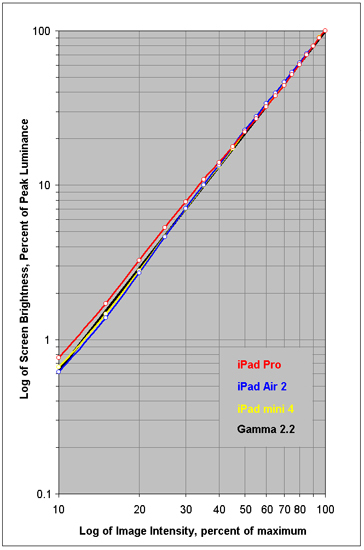 For the iPad Pro there is a significant Intensity Scale bump and irregularity at and below 45 percent signal. While the error may appear small on the logarithmic graph, the iPad Pro Intensity is 21 percent too large at 10 percent signal.